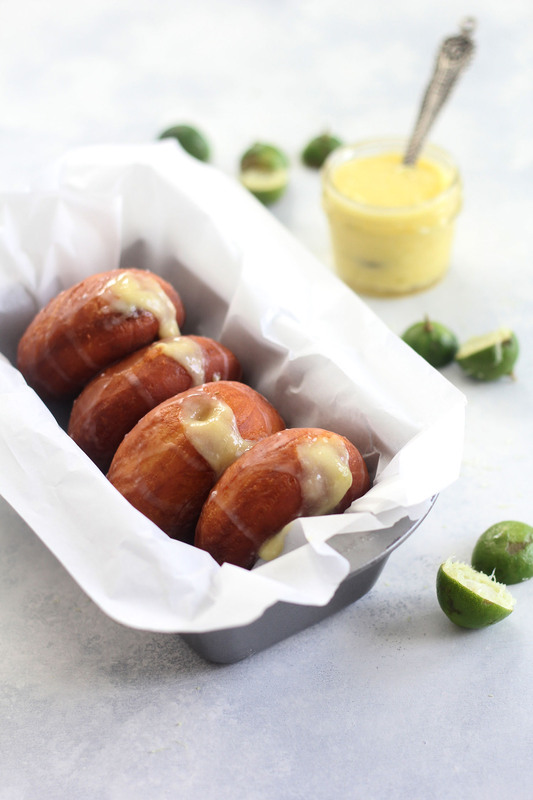 Crisp, fluffy, yeasted doughnuts filled with a tart key lime curd and topped with a sugary sweet glaze. The perfect balance of tart and sweet, these are fun to make and a delicious, decadent treat! Warm the milk to 110-115°F and combine it with the yeast, stirring lightly. Let it sit for 5 minutes or until it foams up a bit. In the bowl of a stand mixer fitted with a paddle attachment, combine the eggs, melted butter, sugar, and milk mixture. Mix on medium-high speed until well mixed and smooth. Oil a bowl and place dough inside, cover with plastic wrap or a clean towel and allow to proof in a warm place for an hour or until doubled in size. When dough has doubled in size, punch it down a bit and roll to ½-inch thickness. Cut out desired doughnut shapes. For filled doughnuts, use a 3 ½-inch diameter biscuit cutter. You can re-roll the scraps, but try not to overwork the dough and let it rest for a few minutes between rounds; or roll into small balls for doughnut holes. Place cut doughnuts on a lined cookie sheet an inch or so apart and cover loosely again, proofing in a warm place for 45-60 minutes. Remove from heat, add butter, and stir until smooth. Pour into a heat safe bowl or jar and place in the fridge until ready to use. Heat oil in a Dutch oven or heavy bottomed pan. Clip on a candy thermometer if you have one and adjust your heat until the oil reaches about between 365F-375°F (** see note) While the oil is heating, prep some cookie sheets with paper towels to place the doughnuts on after they are done frying. When oil is ready, use a spatula to slide a doughnut into the oil. (You may want to fry one at a time until you get the hang of it.) When the bottoms are deep golden (45 seconds or so), use a slotted spoon to flip the doughnut and fry the other side. Place finished doughnuts on the paper towel-lined sheets and continue frying the rest. When doughnuts are cool enough to handle, fill a pastry bag with key lime curd, make a little hole in one end of the doughnut using a chopstick, or something similar in size, and fill the doughnuts. Dip the tops into the glaze and let dry on a wire rack. *If you can't find key limes, regular limes will work. **A candy thermometer works best, but any instant read cooking thermometer will work as long as it can read temperatures up to 400°F. When the oil is too cool, the doughnuts may end up greasy and oily.